Experience the peace and relaxation of our ocean retreat among the privacy of our ancient Douglas firs. It’s all in the name. Timberlane is a nice lane way walk through our old ancient Douglas firs to the sandy shores of the Pacific Ocean. We have six beautiful oceanview suites all equipped with kitchenettes, BBQs and full tiled walk-in rain showers, queen size beds and futons. 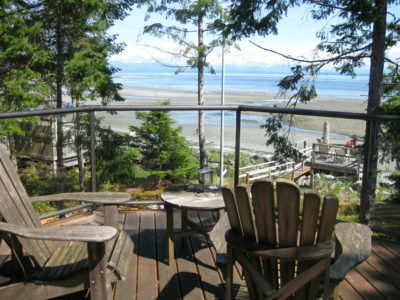 They have cable tv, internet and nice decks to sit and look out at the ocean. Our three cabins are set back in the timbers and offer the same amenities as our suites.